3 unusual ways I make my kids’ challenges disappear. Over my last 2 decades of being a mom I’ve learned some unusual techniques to help out my kids when they are facing challenges. These are the secret contents of my JewishMOM first-aid kit, which I use before I start taking my kids for professional help. 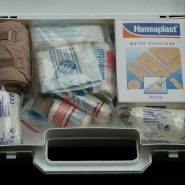 And, surprisingly often, my first-aid kit actually ends up nipping the problem in the bud. First Aid Tip #1: When one of my kids complains about a teacher or a classmate who doesn’t like them or isn’t being nice to them, I tell them that I have a secret way to get this person to stop bothering them, and it always works. On the way to school, they need to pray for that irritating person. I’ve been having my kids do this for at least 15 years, and in my experience it nearly always works to make irritating people mysteriously become much, much nicer. My 1st grader was having a very difficult time with a kid in his class who was driving him crazy. So I tried Approach #1, but maybe he was too little, cause it didn’t work at all. So I spoke with his teachers, and that didn’t help so much either. And, it really worked. 100%. My son went from being a kid who hated school to a kid who started liking school, or at least now he thinks school is OK, which is a dramatic improvement. With this approach, remember, it isn’t enough to just bless your child. You also need to convince him or her that your blessings are a sure thing, they really work! I don’t know if this approach works because blessings actually work, or because of the placebo effect because my kids are convinced that they work. But, I guess it doesn’t really matter, cause it works! First Aid Tip #3: This is another winner, which I’ve used only once, but with remarkable, mindblowing results. Take a photograph of one of your children who is struggling. You can only do this for one child at a time. Spend two minutes a day looking at your child’s eyes in that photograph, and speaking with him as though he has already overcome his struggles. A warning with this approach. Soon after you start, there will be a crisis with your child. Things will get worse before they get better. But just keep on going, and things will get better, G-d willing! Amazing! There is a lot of wisdom in these gems!